San Diego has a lot going on, that’s for sure. Tourists be rest assured that when visiting America’s finest city, you will not be disappointed. There are many events that come and go, for example the magical San Diego Parade of Lights, or the exciting Del Mar Races. So if you’re looking for something specific, make sure you do your research on exactly when you should book your trip. But if your schedule book is wide open, San Diego has plenty of attractions that stay put for your entertainment year round. Here’s a look at the top ten tourist attractions in San Diego that we’re pretty sure you’re going to want to pencil in! The San Diego Zoo is one of the most famous zoos in America, and for good reason. Know as the only zoo on the west coast to have Chinese Pandas, this local attractions hosts over 800 species and 4,000 animals. Prepare to get some exercise as you walk several miles throughout the scenic park located in the beautiful Balboa Park. San Diego’s Sea World is one of the city’s most popular outdoor attractions located just minutes from Ocean Beach, Mission Beach, Pacific Beach, and Downtown. Home to the famous black and white killer whale named Shamu who performs a show in a multimillion gallon tank, Sea World offers a variety of exhibits, shows, and a splash of fun. Take a ferry from downtown San Diego over to Coronado (only $3 each way) or drive across the Coronado Bridge…each an attraction in itself! 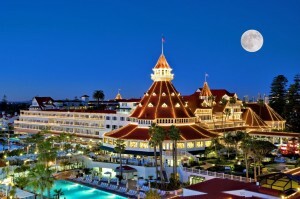 Visit the rich getaway known as the historic Hotel Del Coronado, cruise the waterways in an Italian style gondola, relax on the white sandy beach, enjoy out of this world dining, or explore the many quaint, upscale shops. The south side of San Diego’s downtown harbors a little area known as Seaport Village. Beautifully located right along the water, you will find many shops, eateries, and local performances. Although this can definitely a great day trip to enjoy a sunny day, don’t give in to the many tourist traps situated throughout the village. Grab an ice cream cone, but leave room for a good meal elsewhere. Many of the restaurants tend to be overpriced, and you will surely find better food elsewhere. But for a good atmosphere and a nice stroll, definitely check out Seaport Village. 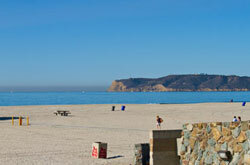 If you brought your camera, Mount Soledad should be a must see on your list of things to do during your San Diego trip. With the most spectacular views in San Diego, on a clear day you will be able to see La Jolla, Downtown, Mission Valley, and maybe even Mexico. The monument honors living and fallen US soldiers and attracts visitors from all over. Take a step back into history as you enter the birthplace of California. The history and culture that remains a part of old town brings local residents and tourists alike over 25 restaurants in a mile radius all offering authentic and cultural cuisine…yes we’re talkin’ margaritas and homemade tortillas. In addition to the food and shopping, Old Town hosts many events and has nightly entertainment in many of the restaurants located here. The Gaslamp District is located in Downtown San Diego, with distinct street lights simulating old gas street lamps. This is where the most popular hotels, bars, restaurants, shopping, and clubs exist in downtown San Diego. 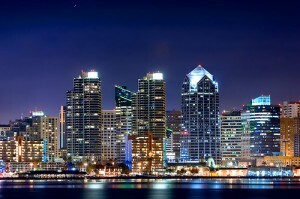 Definitely take a day…or night, to check out this happening section of San Diego. Beginning in 1868, Balboa Park houses stunning examples of Spanish Colonial architecture where you will find a 1,200 acre park with an outdoor concert area, fountain, the San Diego Zoo, tennis courts, an arboretum, koi and goldfish ponds, several museums including the Museum of Man, dog parks, events and festivals, and more. Yeah, there’s a lot going on here, you are guaranteed to find something to do. 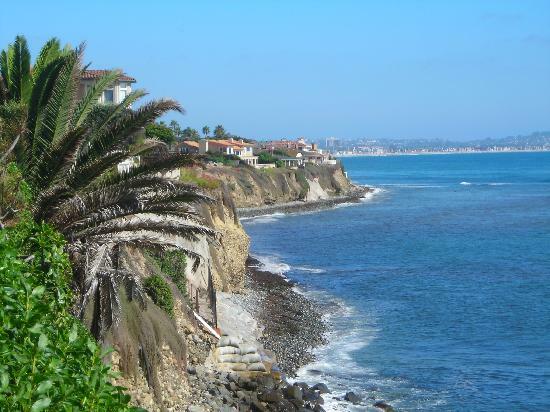 If you’re looking for a day in the water, La Jolla Cove in San Diego is most desirable spot for swimming, snorkeling and diving. Most commonly known as the place with all the seals, this gorgeous cove provides fantastic scenery, and the perfect backdrop for a midday picnic in the Scripps Park, or romantic spot to spread out on the rocks and watch the sunset. In a city known for having perfect beach weather, pretty much all year round, you have to expect good beaches. And this is exactly what you get in San Diego. All along the coast, there are plenty of beaches, all catering to different audiences. 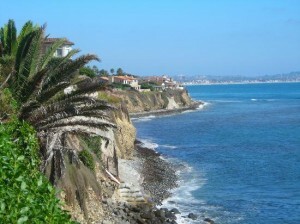 For a college, party crowd go to Pacific Beach, for a more family fun area take the family to Coronado Beach, for a good spot to cuddle up with the honey, check out Sunset Cliffs. 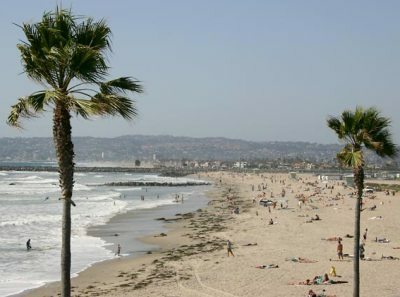 But a beach is a beach, and in San Diego, you can’t go wrong!